24 Station Road was the original Pop up Shop which opened in July 2014. Phillip Milton is a photographer and the current test trader specialising in beautiful landscape photography as well as bespoke portraits and also offers photography tutorials. Phil has been a photographer for 14 years and has been self-employed for the last four. 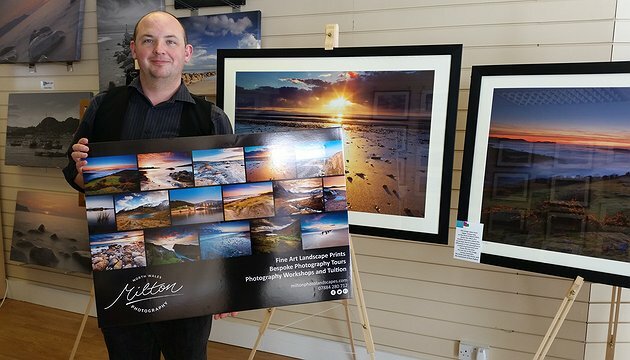 Phil sells a variety of framed fine art landscape prints of North Wales and offers bespoke photography workshops and tours. Phil has been test trading for a few months at 24 Station Road and has found it to be a useful time to reflect on his photography services and products. With the help of the Just The Business team Phil has rebranded his promotional literature with a new logo and a new sign to promote his product and services. Pop-Up Colwyn Bay offered the opportunity to test trade within a retail outlet free of charge for up to 12 weeks. The project was a collaboration between CAIS Employment Services, Conwy’s Communities First and Colwyn Bay Town Heritage Initiative.